Residents from the Mayfield and Montenotte area of Cork claimed yesterday their use of a green area — which they have enjoyed for as long as anyone can remember — is about to end with the building of a gaelscoil and other changes. The case between residents and Cork City Council opened at a special sitting of Cork Circuit Court yesterday. It is expected to continue until Monday. Marie Baker, senior counsel for the residents, said in reference to the council’s plans to dispose of lands for the construction of Gaelscoil An Ghoirt Álainn, and citing case law, she was seeking, “a declaration of the existing right to saunter and wander” at the Tank Field. She had 29 witnesses to call to give evidence of the uses made of the Tank Field over the years. Her first witness, Brendan Goggin of St Christopher’s Rd, Montenotte, recalled starting school in 1949 and going to school through the field, crossing it back and forth throughout the school day, and playing there in the evenings. “The Tank Field was our centre of activities for hurling, football, soccer, rounders; we had trenches, we built cabins, we had games of chasing, cowboys and Indians and games of cards. “Nobody in my 68 years has ever put an impediment on me walking in the Tank Field. Obviously, if there was a match or training on you would respect that,” Mr Goggin said. Precise acreage differed between witnesses but, in approximate terms, the new gaelscoil would take up two acres; Brian Dillon’s GAA club’s unfenced pitches, one of which is to be moved, would take up two acres and over six acres would remain. Ms Baker SC argued that even though the six acres would remain, the changes to the area would effectively end the recreational rights enjoyed by the community, not least in terms of accessing the six acres. Dave Holland SC for Cork City Council outlined details of many access points that residents would have to the six acres of the Tank Field which would not be subject to change. He said that to the extent there would be fences, walls, or railings, there would be numerous gaps to allow access to the green area. 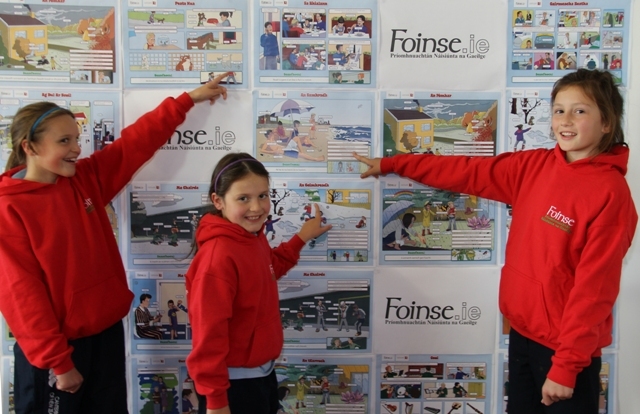 www.Foinse.ie today announced the launch of a new online suite of free learning resources for Primary School teachers and students in conjunction with COGG (www.cogg.ie). Hundreds of top-quality resources, including crosswords, posters, games, fill in the blanks and lesson plans for teachers are now available online for free at www.foinse.ie. The resources are all based on curriculum themes allowing teachers to build entire lessons around the free resources online. The variety of resources to be found on www.foinse.ie means that there is something for all levels of Irish language. Building on Foinse’s reputation for top class educational material, these resources have been developed by Primary School teachers for Primary School teachers. The resources are suitable for all levels of Irish language learners and can be used across many different areas of the curriculum. The new resources include engaging colourful posters based on themes within the curriculum. These posters are designed for ease of use on interactive whiteboards and projectors but can also be printed out and used in a more traditional way. Interactive games, crosswords, jigsaws and fill in the blank exercises are all part of the suite of resources too allowing teachers to cater for different levels of ability within one class. Each week during the school term, there will be a lesson plan in Foinse (available with the Irish Independent every Wednesday) that links in to the resources online allowing teachers and parents the chance to keep children engaged and excited about the Irish language. All you have to do to get started is logon to www.foinse.ie and click on our acmhainní tab to see the whole range of resources available and start having fun in the seomra ranga. Irish Language and Contemporary Arts Practice – an exciting opportunity to venutre into unchartered waters? We’d like to personally invite you to ‘Fás agus Forbairt’, a two day symposium and bursary award scheme that we hope will grab your imagination as an artist, producer or presenter. We intend for ‘Fás agus Forbairt’ to do just that. To explore, challenge and provoke notions of contemporary arts practice in Irish and to support artists in creating fresh, new, innovative ideas. We want to bring artists who speak Irish (and those who just have a ‘cúpla focail’ – whether you use it or not) together to explore contemporary work and potential collaborations and to support these collaborations on a practical level through the provision of development bursaries, mentorship and lab/rehearsal space, details of which will be announced at the sypmosium. ‘Fás agus Forbairt’ will feature presentations and workshops from a number of arts practitioners who are working in English, Irish and bi-lingually, as well as a session with arts programmers and presenters to discuss how artists and presenters can work together to develop new work and the audiences this work deserves. Registration: Registration is open now. We would love to have you with us. Feel free to e-mail borradh.buan@axisballymun.ie for more info. This is a lovely little herostory for children in the age group 4 – 8. It’s a simple, humorous, well-written story about overcoming all the odds and there is an important lesson contained therein: everyone can be a hero if he/she is brave enough. The book is beautifully illustrated with some beautiful coloured illustrations by Mary and Emma Gilleece. This book would be very suitable in class for primary schoolchildren in the age group 4 – 8. Máireád Maguire was born and raised in Limerick. She has spent her working life teaching in her native city, teaching Children with Special Needs in St Joseph’s Primary School in Lisnagry at first and then for thirty years in Scoil Íde, Corbally. She had to retire from teaching in 2009 when she was diagnosed with Multiple System Atrophy (MSA). GAELSCOILEANNA TEO. provide grants to Irish-medium and Gaeltacht schools to fund inter-school events. The grants are always in great demand. Inter-school events provide Irish-medium and Gaeltacht schools with great opportunities to create links with other schools. From quizzes to football matches, events of all kinds promote communication and fun through Irish, which benefits the school, the student and the wider school community. For further information on the grant scheme, email oifig@gaelscoileanna.ie or call 01 8535193. This grant scheme is funded by Foras na Gaeilge.